Codi Frazier, the Keizer 10-year-old who is battling bone cancer, got to be a state senator this month. "It was a great visit," said her aunt, Loni Barrett, of the special activities at the state Capitol on May 7. 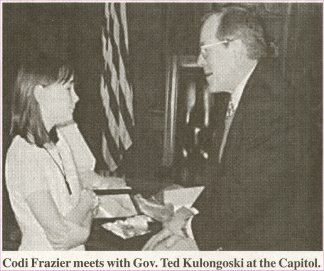 "She got to be Sen. Frazier for the day." Along with the title, Codi conducted a committee hearing, met with Gov. Ted Kulongoski, and held a press conference. She and the governor exchanged gifts - she gave him an engraved clock from Disneyland, and he gave her three autographed items: an Oregon Blue Book, a photo of himself and an Oregon Ducks football. Codi also got to eat in the Senate's members-only dining room. "We had to go to the cafeteria, and Codi ate with all the other senators," Barrett said. "She liked that." Supporters organized the day for Codi, who has been diagnosed with an inoperable tumor in her chest. She was accepted for the trial of a new drug aimed at patients with inoperable cancer, and has begun taking that therapy. Barrett said last week that Codi had handled the first treatments well. "Her blood counts are coming back really well, which is an encouraging sign," said Barrett. The family is waiting for tests to determine whether the treatment is having an effect on the cancer. In the meantime, Codi has achieved one of her dreams - a trip to Disneyland. Barrett, unsure how well she would tolerate the new drugs, whisked Codi off to Disneyland earlier this month, just as she began the drug trial. The three-day visit was a big success. Codi had private meetings with both Mickie and Minnie Mouse, and ate at Goofy's Kitchen three times. "Make-A-Wish paid for the first night and it was so much fun, we decided to do it three nights in a row," said Barrett. In addition to the Make-A-Wish Foundation, Codi's school - Cummings Elementary - set up an account to raise money to defray her family's costs and also help pay for her wishes. The Keizer Rotary, Salem Kiwanis, West Salem Rotary, local firefighters and other community supporters have been big contributors. Char Sachtjen, principal at Cummings, said that as of Tuesday donations to the fund had topped $8,600. She said that ranged from $10 checks from residents who read about Codi in the Keizertimes, to larger contributions from civic groups. "The generosity is very touching, and very helpful to Codi's family," she said. Meanwhile, Codi continues the therapy, and family members pack her days with the activities of a lifetime. "I'm hoping that she turns into a miracle story," said Barrett. Codi is scheduled to be co-grand marshal of the American Cancer Society's Relay for Life, set for June 13-14 at Chemeketa Community College. She will share the honor with Brian Holt, also of Keizer. Brian's brother, Chris, died Jan. 1 of complications from leukemia.